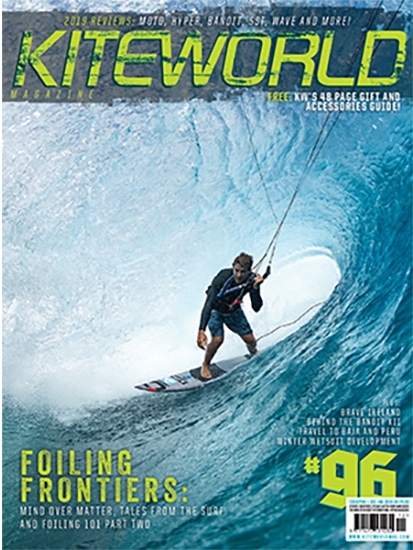 First, hats off to Reo Stevens, for once again nailing a Kiteworld Magazine cover! Only Reo can make a kite loop into a Teahupoo barrel look stylish and easy (check out his lines), while also hoping to find his way deeper into the next pit out there. For us mere mortals with contorted barrel faces (if we can even make it there), at least we have the Kite Gun, which Reo rides on the cover. Or, if you need a board for bigger, more hollow, more powerful waves, the Kite Gun can function as that extra rail line you need. 5’8” - We have 2 that will be in stock soon, they are currently in the shaping room. Give us a call to order! If you’re not sure that the Kite Gun is the board for you, take a look at the video below. We’ve watched this a few times and are still hoping that we absorb some of Reo’s skills from our computer screens. It hasn’t happened yet, but at least we’re less likely to dig a rail and feel more in control when it’s overhead. Give us a call at the shop if you have any questions or want to order one of these for your next kite trip! Pre-orders are welcome for the 5’8”s that are coming soon.